Beds: 2 Simple Bed. 1 Double Bed. 1 Sofa Bed Double. Building amenities: Barbecue. Patio. Colonial Style. 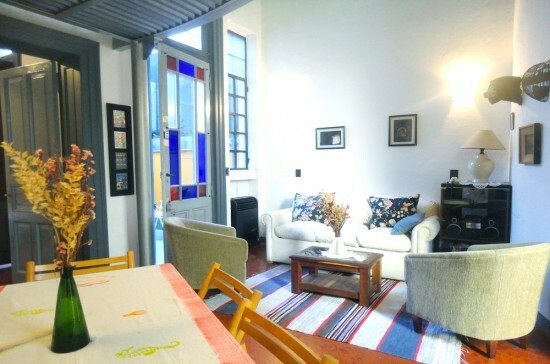 Wide, comfortable, quiet and sunny apartment with 2 bedrooms, located in the historical part of San Telmo. It has been recycled to it is original architectonic style, with high ceilings, built with heavy concrete. The original doors open to 2 patios. In one of them there are garden chairs and tables, and in the other one, a barbacue grill. The main bedroom has a double bed, a wide closet, a work desk and a TV. The second bedroom, on the upper floor, has two single beds (that can be put together to form a double bed), a desk, and two sofas. The living room is equipped with 2 individual sofas, a double sofa-bed and an audio system. Fully equipped kitchen connected to the dining room. We had three wonderful weeks in this lovely apartment. We know Buenos Aires very well and had rented many apartments before but this one was so far our best catch and will for sure be an option for our next stay. The apartment is located in the most charming part of Buenos Aires, it´s very stylish and excellent equipped (eg: a washing mashine is not found too often in tempoarary apartments and very handy!). The owener are very nice and reacted prompetly when we had a request. The apartment holds what the prictures promises.Thumbs up! Great apartment, great area, great price.. the owner was more than accommodating when we needed some last minute changes. The apartment was in great shape.. beats a hotel any day!